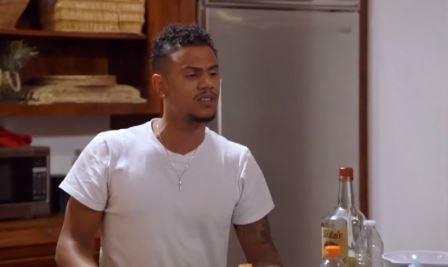 Last night on Marriage Boot Camp: Hip Hop Edition, Tiffany Campbell confronted Lil Fizz about his relationship with Nia Riley. She is very unhappy with how cozy the picture of him and Nia appears. Lil Fizz claims they are just friends, but is also extremely defensive when questioned. At this point, I don’t even know why it matters. This has man has done everything, besides putting it on a billboard, to show Tiffany he has no real interest in her. Her questions would be valid if they were in a relationship, but given their circumstances, it should just be another reason to move on. Is Nia interested in Fizz as more than a friend? Tiffany continues to grill him on Nia. She wants to know how many times have they hung out. Lil Fizz tells her people have always been there when they have seen each other. She is upset that Nia has been around his son and she hasn’t. Fizz tells her to get over it and find someone who isn’t a public figure. He is tired of people asking him about Nia when she is in a relationship. She asks Nia directly and her story is different. At this point, who cares? They are not in a relationship and he doesn’t seem to ever want to be in one. His contempt for her practically leaps off the screen. Waka Flocka and Tammy Rivera get into a heated argument in the kitchen. He wants her to make grits, but there is no butter. That somehow becomes a petty argument. Tammy feels like Waka does things for the camera. He feels she is disrespectful. I am leaning toward Waka’s side. Tammy seems to blow up out of the blue. Dr. Ish and Dr. V talk to Tammy and Waka. It’s clearly not about the grits. There is something boiling under the surface. Tammy reveals she has an issue with someone talking down to her. In her previous marriage, she was mentally and physically abused. Her past has made her defensive and angry. Their communication problems seem to ignite the other issues that are under the surface. I’m sure him cheating a million times also hasn’t helped. The experts give the couples a communication exercise to figure out their disconnect. They will each have to go through a maze while being guided by their partner. Waka and Tammy are first and he completely ignores her instructions. 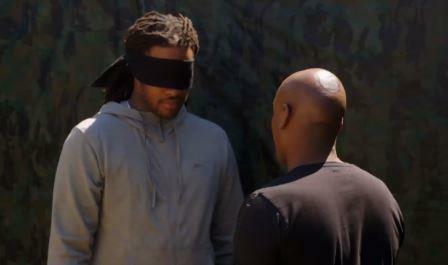 Lil Mo and Karl Dargan are like dumb and dumber in the maze. Tiffany does a good job of directing Lil Fizz. Soulja Boy couldn’t direct Nia. So, he comes in the maze to get her. He is the only one that went in after his significant other. 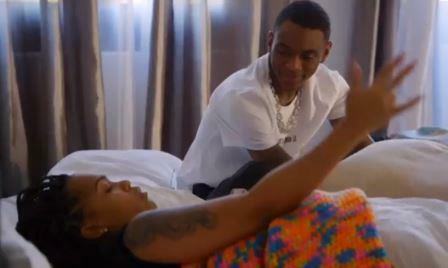 After the drill, Soulja Boy approaches Nia in their room and asks if she loves him. Nia does not want to have this conversation. He even asks when they will get married. Her response is “stop asking me that.” Hmm… tonight we are seeing a softer side of Soulja. Nia is still trying to find a way to forgive him from all of his disrespectful posts on social media. I don’t blame her for being hurt at all. But it seems like Soulja Boy is starting to take Marriage Boot Camp seriously. He even applies what he has learned when communicating with Nia. He wants to solidify their relationship and give it a label. Nia feels pressured and is not sure he has changed. Soulja Boy is confused. She says she wants one thing and then denies it. Karl gives Nia some advice about her relationship. She feels that Soulja Boy isn’t serious when he asks to marry her. Karl tells her to call his bluff and stop assuming he isn’t telling the truth. The couples are called out to the pool for another exercise. Each couple has to try and hold their ground while playing tug of war over the pool. Soulja Boy is pulled into the pool in two seconds. I don’t think this is a surprise to anyone since Nia looks like she could bench press him. 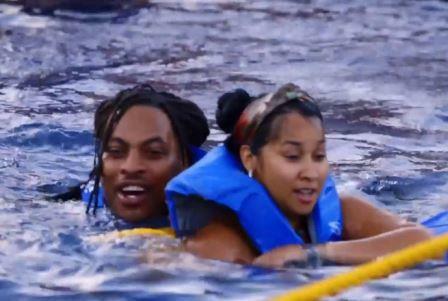 Waka pulls Tammy into the water and jumps in behind her. Lil Mo and Nia double team Karl and send him flying into the pool. Shawne sets up Jessica to fall into the pool under the guise of advice. The experts later reveal the point of the drill was for no one to get wet. They simply had to stand there and hold the rope. It was their own senses that told them to drag their partner into the pool. The boot campers are chastised for being high during the drill. They ask the group to ease up on smoking weed. This is not received well by several people. Shawne is the voice of reason. He understands that it’s easier for them to be evaluted, if they aren’t self-medicating. During the evaluation, many couples express concern with Soulja Boy and Nia. Judge Lynn Toler was disappointed in Nia’s reaction when Soulja came to her with his heart on his sleeve. She also warns the group to stop self-soothing and to truly be present in their relationships and in therapy. TELL US- DO YOU THINK SOULJA BOY AND NIA RILEY SHOULD GET MARRIED? DO YOU THINK SOULJA BOY HAS CHANGED? SHOULD TIFFANY GIVE UP ON LIL FIZZ? DO YOU THINK NIA AND LIL FIZZ ARE LYING ABOUT THEIR RELATIONSHIP?